Just One More Book is a fantastic podcast about kids books. Hosts Mark and Andrea have an absolute passion for kids books and they approach each book with great enthusiasm and knowledge. Not only do Mark and Andrea review books, they also have listeners submit book reviews which adds a nice touch of community involvement to the podcast. But book reviews are just the start. They are connected, and feature interviews with authors and the people passionate about writing. Henry Winkler (yes, that Henry Winkler), poet Jack Prelutsky, and Eleanor Wachtel, host of CBC’s Writers and Company are just a few of the guests they have interviewed. And it made my day to hear a review of Berkley Breathed’s Edwurd Fudwupper Fibbed Big . Oh, the fond memories I have of Bloom County. They also take the show on the road, as they did earlier this year when they attended the 100th anniversary party of the release of Anne of Green Gables in Toronto where they had a chance to speak with former Canadian Governor General Adrienne Clarkson. Most shows are bite sized 7-12 minutes and the production values are high, making for a very enjoyable 10 or so minutes. If you are looking for some good kid book talk, Just One More Book fits the bill nicely. I broke one of my Daddy guidelines with The Girl last night. Normally, I am hyper-vigilant about her media consumption and I try to filter as much of the content she sees and hears before it gets to her. I know we only have a few years where we are in control of the messages she gets, so I want to take advantage of it. Last night, in a moment of what I can only describe as sheer technology enthusiasm, I let my filter down. See, The Girl is a big fan of audio books. She uses them to help her get through the nap period at preschool. She hasn’t napped in over a year, but her preschool still has to have a mandatory period of quiet time each afternoon while the younger kids sleep. So to help her pass the time, I got her an MP3 player and have been loading it with audio books from her collection. Yesterday, I discovered I can download audio books from our local library. Here’s where my geek enthusiasm took over. I was so excited to try out the process that I went straight to the kids books and searched for audio books for her. The only thing that looked vaguely age appropriate was an anthology called Junie B. Jones. My wife mentioned that the name was familiar, probably from the Scholastic book order forms that roll through pre-school every once in awhile. That was enough of a recommendation for me, and off I went and downloaded it, set it up on the mp3 player and handed it over to The Girl, who spent the next 2 hours mesmerized by the tales of Junie B. Jones. It was only then that my own media filter twiged and I realized that I had no idea what my kid was listening to. So I went to my favorite source for all things kid media, Common Sense Media and read the reviews by both parents and the site editors. If you are not familiar with Junie B. Jones, here are a few selected comments from the reviews. Parents need to know that much of the humor comes from Junie’s bad behavior. Young readers are supposed to laugh at it, not emulate it. I am left of the left when it comes to most anything in this world. And, I eagerly encourage my children to read and love books. HOWEVER, Junie B. Jones is the closest I’ve ever gotten to banning a book in our house. The grammar/language is just horrible and the stories of misbehavior are way too numerous and validates, for a preschooler,rude behavior. Well, you can see why I was regretful for my lapse in judgment. I immediately listened to the audio book and realized I completely agreed with all the reviews. Junie B. Jones is terrible. Needless to say, the digital Junie has been returned to the library. Nice thing about working with a 5 year old is that she stills believes me when I tell her the digital audio file needs to be returned to the library. This highlights why I truly appreciate a site like Common Sense Media. Not that I neccesarily agree with every review they post, but their reviews combined with other parent reviews makes it a great starting point when it comes to evaluating age appropriate media. The site has recently undergone a homepage makeover to make finding info even easier than before. If you need a good starting place when it comes to figuring out of something is appropriate for your kids to view, read, play or listen to, consider starting at Common Sense Media. This is one cool little table. I look forward to the day when tools like these are affordable enough to have in the home. I suspect that day is pretty close at hand. Like any other technology,I would expect to see the price of these kinds of tables to fall in the next 5 years. Email is a tool for old fogey’s. According to a study by Parks Associates, only 20% of teens use email to communicate with friends. In fact, the most common reason a teen would use email is to communicate with us old folks. Not surprising, text and instant messaging are the way to go. Apparently, all the cool parents are doing it. A recent poll by AT&T (a company that has a vested interest in promoting texting) found that 76 percent of parents feel their kids keep them in the loop through text messaging than other communication methods, and almost 3/4 of parents said their kids were more likely to respond to a text message than another methods of communication. If you have teens, you may want to check out these 7 reasons to take up texting with your kids. Note that these come from a document put together by Cingular (pdf). Like AT&T, they also have a vested interest in getting you to text message your kids- they make money. But I think the principles are sound nonetheless and deserve a mention. Parents get a quick answer to their questions – good for today’s busy kids and parents. Kids are more apt to respond to text messages when they are with their friends. It is more discreet and their answers don’t have to be as detailed as in a conversation. You, or they, don’t have to worry about tone of voice. Some kids automatically get defensive when they hear their parent’s tone of voice, which often results in delayed return phone calls or avoidance. Texting takes tone of voice out of the mix and can improve response times. Text messaging allows parents to compose and edit a message before pressing send. By making parents think about it more, texting removes explosive emotions from potentially charged communications and situations. Texting vs. calling gives kids more space but allows parents to keep in touch as often as necessary. For instance, it is a good way to double check their child’s whereabouts without nagging. audition, or let them know you are thinking of them if there is something they were concerned about such as a difficult test or a grade. Are we outsourcing our memories? I have a distributed family – brother in Alberta, parents on the prairies, aunts, uncles and cousins scattered everywhere. One of the primary reasons for this blog was to keep those folks up to date on what was happening with my (then newly arrived) daughter. A blog seemed like the best way to do that. Fast forward to 2008 and there are now a plethora of ways you can keep far flung family and friends informed of the little one’s first anything. Totspot, Kidmondo and Lil’ Grams are three web services that allow parents to easily store and organize your babies firsts. And there is a new site in beta called Odadeo, targeted directly to us Dad’s. First off, I think these services are great, and go a long way to avoiding having to send out a hundred emails to everyone who you think might be interested in little Billy’s first toddle. But beyond their usefulness, these services provide further evidence to me that we are undergoing a profound cultural change. Undoubtedly, we are beginning to raise the most documented generation of people in the history of civilization. Every moment of our kids lives are being not only captured, but digitally manipulated, stored and shared via our outboard brains. What is this going to mean to them in the future? And what is it going to mean for me, the person documenting this? Marta Strickland has been thinking about this as well. In a recent post she mused about posting our kids life online before they are even aware they have a life. Is it convenient to have these services, or is it what the New York Times recently called baby overshare? Are we parents somehow co-opting our babies lives and playing out our own narcissism? Hey, look at me and what I have produced! World, take notice that I can reproduce! It seems to me that this baby thing is becoming quite, um, hip (which is a whole other post). Personally, I appreciate the convenience and ability to share information about my kids with people close to me. If someone wants to find out what is happening in my kids life, they know where to look. But I always have to balance that desire to share with respecting my kids rights. I post and share with their voice in the back of my head, imagining that they will someday troll back through the interwebs and find this stuff. How are they going to react? Or are they even going to care? My hope is that they will look back on the content I have created about their lives with joy and tenderness and realize it came from a place of love and was triggered by the joy of becoming a Dad. But really, I do this for me. I post so I can remember. I post so I can process. I post to help me understand. Recently I spent some time on this blog, digging around the archives, cleaning up things (hopefully in preparation of a visual upgrade of the site, so if the site changes soon don’t be shocked.). In the process of doing that, I found articles I had written years ago that I had forgot about. They are mostly the little ones, the ones that usually go unnoticed by most readers. The personal ones. Coming across them makes me reflective, makes me remember and makes me smile. And that is why I document. As The Girl gets older and spends more time online, I have been thinking more and more about internet safety. Google and Common Sense Media have teamed up to create this video of common sense tips and rules for families to help keep kids safe online. The nice thing I like about this video is that the advice is more about teaching appropriate use, rather than trying to shield your kids from the big bad world. Cyberbullying, using social network privacy controls, media literacy and setting basic rules are all covered in this 7 minute video. A bit Google heavy (hey, look Picasa, Google Chat and Blogger all have safety features), but still an informative primer for families who have kids that are starting to explore the online world. In case you missed the excellent PBS Frontline documentary Growing Up Online that aired a few weeks back, PBS has put the entire documentary online. If you have kids, especially if you have kids that are spending time online, you should check this documentary out. A bunch of 7-9 year olds in North Carolina were recently given the task of “designing” the perfect laptop. As someone who works in educational technology I’m finding some of the drawings these kids came up with quite interesting and more than a tad disconcerting. Looking at these designs, it seems that the commercial and pop culture side of the web is hands down beating anything educational for these kids. To these kids, the web is a place where you buy things, play games, catch up on pop culture news and connect with friends. Not surprisingly, almost every kid has a Games button, but what I find most fascinating is how attuned these 7-9 year olds are to consumer culture, marketing and pop culture. There are designs with buttons labeled “Buy”, “Shop” and “Order”, reflecting the fact that, to these kids buying things online is a perfectly natural extension of going online. Compare that to 10-15 years ago when e-commerce was still met with skepticism by many. To these Millennial, it is just part of their everyday life. There are also buttons rife with pop culture references, like Webkniz and Barbie.com, and lots of gadget buttons. iPod, cell phone, video camera buttons, reflecting the ubiquity of electronic devices in kids lives. I’m sure it has been stated by someone somewhere, but it seems self evident that their generation will be the most documented in history. I’m disheartened to find a lack of buttons to things like “dinosaurs” or buttons labeled National Geographic Kids or NASA Kids. It’s sad to think that well done information sites aimed at kids are losing out to Webkinz and Barbie. But I suppose if we had the same exercise with College level students we would probably see more Facebook and YouTube than their college library buttons. One kid, bless ’em, did include a magical button that I am sure every parent would occasionally like to have on their keyboard – “babysitter”. You can see some of the drawings these kids did at The Morning News site. If you want to read the original blog post (no photos, but more info on the laptop club), parent.thesis family blogger Amy Tiemann had the original post on CNet. A durable digital camera designed with children in mind. Drop it-step on it-toss it! No matter what, it keeps on working and working! With an LED screen and a dual viewfinder for photos or videos, this camera is a true gem. Fully loaded with games, an editing option to add borders, silly features and sound to their photos. Once the masterpieces are complete, they can be reviewed on the LED screen, shown on your television or downloaded to your computer. This versatile and amazing camera offers a wonderful opportunity to introduce your child to the world of photography! The site also has Children’s Choice, Best Bets, and Great Books categories. The Toy Council has been doing this since 1952, and they test these products with kids. They pick toys and send them home with kids for 6 to 12 weeks to try to simulate how these toys will be actually used. We’re just starting to think about Christmas for the kids and passing along tips for our family members so the timing of this is perfect. One more tool as we start making some Christmas purchasing decisions. I’ve been following Nicolas Negroponte’s One Laptop Per Child initiative since it was announced in 2005 and it is great to see things coming to fruition. Negreponte, if you are unfamiliar with his work, was one of the founding directors of the MIT Media Lab, one of the foremost computer research facilities on the planet. 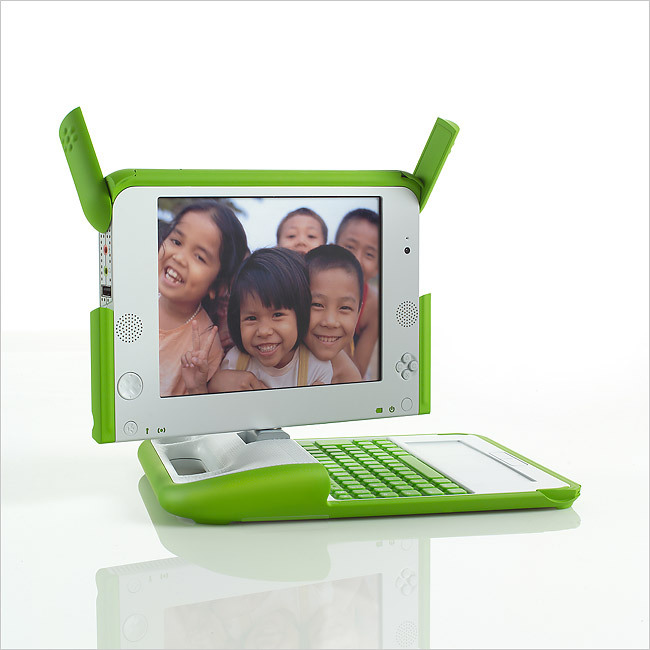 The gist of One Laptop Per Child is to provide every child in the developing world with a laptop computer. Last year, the design was unveiled, and it is a marvel. Rugged, low-powered (using less than 10% of the power of a regular laptop), they use flash memory instead of a hard drive and use Linux as their operating system. Plus you can get a bunch of machines together and set up an instant network just by powering them up. The idea was that once this thing was designed, orders from developing countries would come in and cheap laptops would flood into the developing world helping to bridge the technology gap between the developed and developing worlds. Initial enthusiasm from countries like Brazil and Nigeria helped fuel the project, along with $40 million in donations. The laptop is now ready for the world. And to kickstart the project, the computers will be available to us in North America in a very unique way – a promotion called Get 1 Give 1 where Americans and Canadians can buy two laptops for $399. One gets donated to a child in a developing nation, and the other one is shipped to you for Christmas. The donated computer is a tax-deductible charitable contribution. The program will run for two weeks, with orders accepted from Nov. 12 to Nov. 26. Their website has some more info. I’m thinking that The Girl is getting into playing on the computer, and this thing is supposedly indestructible. $200 for a laptop that she can use for the next few years plus a donation to a cause I believe in might make this her Christmas present this year.